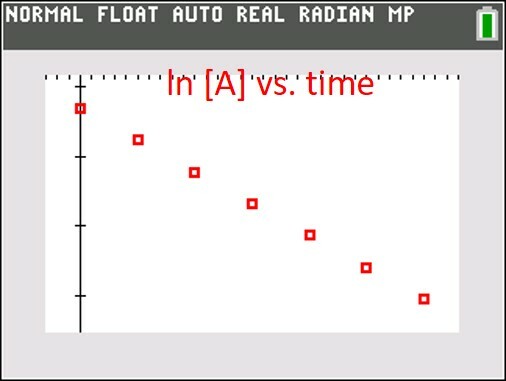 It should be pretty obvious that the red graph (ln [A] vs time) is the only linear graph, and that means the reaction is first order with respect to [A]. The rate equation is thus: rate = k[A] and the absolute value of the slope of the line (found using a linear regression) is the rate constant k.
What if the data has a bit of variability in it and the data doesn’t fit perfectly on a straight line on any of the three graphs? With your graphing calculator, create the three scatter graphs as I did above, then perform a linear regression on each graph. The graph with r2 closest to 1.0 will be the correct graph. The following initial reaction rate data was collected. Determine the rate equation for this reaction. These problems are pretty easy to solve if you have learned exponential equations in algebra 2. The trick is to compare two different reactions where only one compound changes its concentration. For example, if you compare reaction 1 with reaction 2, you will see that [A] changes and [B] is the same. If you compare reactions 2 and 3, you see that [B] changes and [A] is held constant. However, when you compare reactions 1 and 3, both [A] and [B] change. So do not compare reactions 1 and 3. Therefore, your job is to determine the values of m, n, and k. You do this by taking the values from the table and plugging them into this equation. Let’s find the value of m first. You need two equations where [A] changes and [B] does not—that is, equations 1 and 2. Unless told otherwise, you can assume that the exponent is supposed to be an integer, and therefore m= 1 in this problem too. Thus n = 2. Now we can solve for k by taking any of the three original equations and plugging in all the given values. Let’s use equation 3. Now here’s an additional trick I give you at no extra charge: If you are pretty good with exponents and scientific notation, you should see that you can often solve for the values of m and n in your head. In our first step, the rate doubled when [A] doubled, so the rate with respect to A is first order (m = 1). In our second step, the rate quadrupled when [B] doubled, so the rate with respect to B is second order (n = 2). (That was certainly a lot easier than the work we did above!) Then plug the known values into the rate equation to solve for k.
When we study rates of chemical reactions, we look for an equation that describes the reaction rate. The equation can be in one of two forms, known as the differential rate law and the integrated rate law. If you have taken calculus, you’ll recognize these names and you even know how to derive the integrated law from the differential law. If you haven’t taken calculus, don’t worry! You probably won’t be asked to derive the equations. However, you should recognize each form of the law for zeroth, first and second order reactions. The differential rate law gives the reaction rate as a function of the concentration of the reactants. 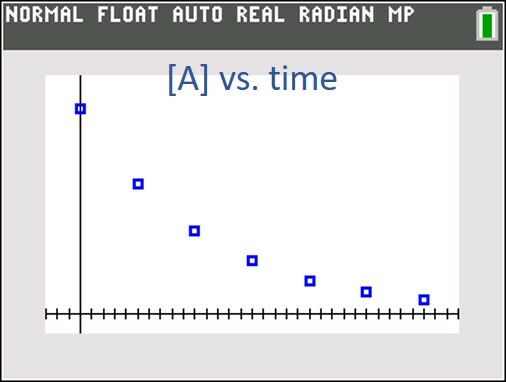 The integrated rate law gives the concentration as a function of time. Both equations are useful, and you will probably use both in your chemistry class. The table below shows the two rate laws for each reaction order in terms of a single reactant A. You might have noticed that each of the integrated law equations is in the form y = mx + b, the equation for a line. In the old days (before graphing calculators), this is the method that chemists used to determine the reaction order. If the graph of concentration vs. time is a straight line, the reaction is zeroth order. 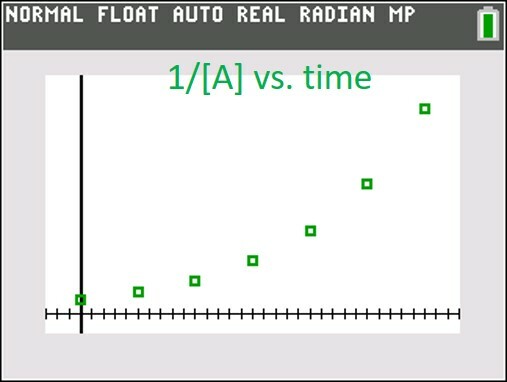 If the graph of ln(concentration) vs. time is a straight line, the reaction is first order. And if the graph of 1/concentration vs. time is a straight line, the reaction is second order. Example: The temperature of a beaker containing 150 mL of water drops by 3.85°C when 8.00 g of ammonium nitrate are added. Determine the molar heat of solution for ammonium nitrate. Assume the specific heat capacity of the solution is 4.18 J/g·°C. Notes: We must include the mass of the ammonium nitrate in the M-CAT equation because it cools down along with the water. We also assumed the specific heat capacity of the solution was the same as the specific heat capacity of pure water. For dilute solutions, this is a reasonable assumption. Calorimetry refers to the measure of how much heat is transferred in a reaction or phase change. We measure this heat with a device called a calorimeter. Although serious chemists will use serious calorimeters costing hundreds or thousands of dollars, you can duplicate much of their work by pouring some water into a Styrofoam cup. Your answers won’t be as precise as the serious chemists’ answers, but for two or three sig figs, this method is good enough. There are two kinds of calorimetry problems; we’ll look at one here and the other in the next post. The first involves dropping a heated block of metal into the cup of water. The block cools down and the water warms up until the block and water are at the same temperature (thermal equilibrium). In the second type of problem, a chemical reaction takes place in the water. If the reaction is exothermic, the water absorbs the heat and warms up. If the reaction is endothermic, heat is absorbed from the water and the water cools down. Let’s examine the first problem: There are two guiding principles we observe. The first is that heat will flow from the hot block into the water until the block and the water are at the same temperature. The second principle is that (we assume) there is no loss of heat to the air. In other words, the heat lost by the block exactly equals the heat absorbed by the water. Here q is the amount of heat gained or lost, m is the mass of the substance, c is the specific heat capacity of the substance, and ΔT is the change in temperature. Many teachers call this the M-CAT equation because the Δ looks like an A if you squint really hard. If this helps you remember it, you can call it that too. The value of c, the specific heat capacity, is a constant for a given substance. It measures how much heat must be absorbed by 1 g of a material to raise its temperature by 1°C. You might be asked to memorize the specific heat capacity of water. It is 1.00 cal/g·°C or 4.18 J/g·°C. You probably will not need to memorize specific heat capacity values for any other substance. Example 1: A 25 g block of aluminum is heated to 85°C and placed into a calorimeter with 80 g of water at 25°C. The final temperature of the calorimeter and block is 28.8°C. Calculate the specific heat of aluminum. Solution 1: We calculate the ΔT of the water (3.8°C) and the aluminum block (-56.2°C) and plug everything into the equation above. (80)(4.18)(3.8) = -(25)(c)(-56.2). Solving gives c = 0.90 J/g·°C. Example 2: A 25 g block of aluminum is heated to 85°C and placed into a calorimeter with 80 g of water at 25°C. The specific heat of aluminum is 0.90 J/g·°C. What is the equilibrium temperature of the calorimeter? Distribute and simplify to get 334.4 Tf – 8360 = 1912.5 – 22.5 Tf. Solving gives Tf = 28.8°C. Note: This is one of the rare times you do not need to convert the temperature from °C to kelvins. This is because the temperature term in the equation is a change in temperature and not an absolute temperature. Changing the temperature by 1°C is the same as changing it by 1 K.
Do you have to memorize all of these? No. If you are a high school chemistry or physics student, you should know the prefixes in blue above. If you are an AP chemistry or AP physics student, you should also learn the prefixes in red. If you plan to be a scientist or an engineer, it wouldn’t hurt you to learn the rest, but the extreme prefixes are not so common. Write out the balanced equilibrium equation. On the first line (I), put down the initial concentrations of each compound. If a compound is not in the initial mix, write 0. Be sure that you calculate the molarity, and not just the number of moles. Pick a direction for the reaction to proceed. It’s usually pretty obvious, but if you aren’t sure which way the reaction will go, just choose one direction. It doesn’t matter if you guess wrong. On the second line (C), use a variable to write the change in concentration for each compound using the balanced equation as a guide. For each compound that is consumed, write –Ax, where A is the coefficient of the compound in the balanced reaction. For each compound that is being formed, write +Ax. See the example below. On the third line (E), write the sum of the first two lines. This must be the final concentration of each compound. Use the equilibrium law and the value of Kc to write an expression with the equilibrium concentrations. Then solve this equation for x. Example 1: 1.0 mole of H2 and 1.0 mole of I2 are placed in a 2.0 L flask. The following reaction takes place at 400°C: H2 (g) + I2 (g) → 2 HI (g). What are the concentrations of the three compounds at equilibrium? The Kc for the formation of hydrogen iodide (HI) from hydrogen and iodine gases is 64.1 at 400°C. Solution: Start by writing the equation and the initial concentrations. Don’t forget to divide by the volume to find the molarities of all the compounds. Example 2: The reaction in Example 1 is repeated at a different temperature with the same initial concentrations, and the final concentration of HI is determined to be 0.60 M. Determine the value of Kc at this new temperature. When balancing redox reactions, you must start by finding the number of electrons transferred in each half reaction. You usually can’t get the charges to balance if you don’t equate the electrons. In this post, I show you how to balance a redox reaction in a basic solution. Example : Iodide ions are oxidized in a basic solution by permanganate ions to produce iodine and Mn2+ ions. Show the balanced reaction. Determine the number of electrons transferred in each half reaction, and balance the electrons. Balance the oxygen atoms by adding water molecules. Balance the hydrogen atoms by adding H+ ions. Check you answer by verifying that the charges are balanced. Cancel out the H+ ions by adding an equal number of OH– ions to both sides, which changes the H+ ions into water. The equation should be fully balanced, and we check our work by verifying the charges balance. 10- (the iodide ions), 2- (the permanganate ions) and 16+ (the hydrogen ions) gives a net charge on the left of 4+. On the right side, we also have a total charge of 4+. When balancing redox reactions, you must start by finding the number of electrons transferred in each half reaction. You usually can’t get the charges to balance if you don’t equate the electrons. In this post, I show you how to balance a redox reaction in an acidic solution. We check our work by verifying the charges balance. 3- (the permanganate ions) and 4+ (the hydrogen ions) gives a net charge on the left of 1+. 6+ (the manganese ions) and 5- (the nitrate ions) on the right also gives a net charge of 1+. We have succeeded! Solution: In this reaction, the Cr atoms go from an oxidation number of 6+ in the dichromate ion to an oxidation number of 3+ in the chromate ion. Therefore, each chromium atom gains three electrons. But since there are two chromium atoms in the dichromate ion, we must think of this half-reaction as gaining six electrons overall. The sulfur atom goes from an oxidation number of 4+ to 6+, so it loses two electrons. We check our answer by checking the charge on each side. The left side has charges of 5+ (the H ions), 2- (the dichromate ion) and 3- (the hydrogen sulfite ions) for a net of zero. The right side has charges of 6- (the sulfate ions) and 6+ (the chromate ions) also for a net of zero. When balancing redox reactions, you must start by finding the number of electrons transferred in each half reaction. You usually can’t get the charges to balance if you don’t equate the electrons. In this post, I show you how the process works when both the oxidizing agent and the reducing agent are single elements. The charges balance, as required.